London, UK. 09/07/10 - Justice has a new name in the year's most charming superhero dramedy DEFENDOR, released on DVD on September 6, courtesy of Sony Pictures Home Entertainment (RRP £13.99). Woody Harrelson (Zombieland; 2012) suits up for adventure in the story of a man who transforms into a hapless superhero in order to combat crime and injustice in his local city. The film co-stars Sandra Oh (TV's "Grey's Anatomy," Sideways) and Kat Dennings (Nick and Norah's Infinite Playlist, The House Bunny), and will make you cheer for an unforgettable new kind of superhero who - through his quirky ways and unconventional weapons - ends up rallying a city. 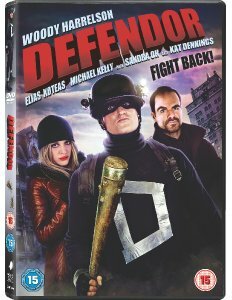 After wowing audiences and critics at its 2009 Toronto International Film Festival premiere, DEFENDOR now rises on DVD, armed with bonus features including feature length commentary with Woody Harrelson, Kat Dennings and the filmmakers. In addition, there are five revealing featurettes that take viewers behind the scenes of this innovative new kind of superhero movie, deleted scenes and outtakes. Arthur Poppington (2009 Academy Award® Nominee Woody Harrelson - Best Supporting Actor, The Messenger) doesn't need superpowers or fancy toys to fight crime. Armed only with a childlike sense of wonder and his quirky arsenal of cheap, homemade gadgets, he becomes DEFENDOR! He finds an unexpected partner when he rescues and falls for a local prostitute (Kat Dennings, Nick and Norah's Infinite Playlist). Can the two of them take down the city's most fearsome crime boss without getting killed in the process? DEFENDOR marks the directorial debut of actor Peter Stebbings (K-19: The Widowmaker), who also wrote the screenplay. It was produced by Nicholas Tabarrok (Left Behind 1-2, Weirdsville). The film's co-stars include Elias Koteas (The Curious Case of Benjamin Button), Michael Kelly (Did You Hear About the Morgans? ).